(TORONTO) – Whether they’re accelerating up the onramp or resting at curb side, Canadian drivers know the GSseries from Lexus epitomizes luxury performance. With the choice of two engines, two drivetrains, and the influence of L-finesse design language, performance, luxury and safety can co-exist, creating bold and dramatic driving moments. Power and poise are the watchwords for the rear-wheel-drive GS350. Additional traction and control in varied weather conditions can be found in the GS350 AWD. And with its larger engine and remarkable eight-speed transmission, the GS460 delivers truly intelligent, effortless performance and unsurpassed luxury. All GS models offer the security of standard active and passive safety features and technologies, such as: Vehicle Dynamics Integrated Management System (VDIM), Vehicle Stability Control (VSC), TRAC (Traction Control), Hill-Start Assist (HAC), and eight airbags. A range of available upgrade packages enables Canadian drivers to create a GSperformance luxury sedan that surpasses their needs and desires. The 2009 Lexus GSseries is now on sale at Lexus dealers across Canada. The suggested retail price starts at $52,450 for the GS350. The sure-footed Lexus GS350 AWD starts at a suggested $54,450, while the outstanding performance of the GS460 can be enjoyed starting at a manufacturer’s suggested price of $63,850. The Lexus GS350 performance luxury sedan is poised and powerful, drawing on ample horsepower and torque generated by a 3.5L V6 mated to a six-speed automatic Super Electronically Controlled Transmission (Super ECT). The result is a highly responsive performance vehicle that also delivers the refinement and elegance of a true luxury sedan. For added control, Canadians may enjoy the same stunning performance in the sure-footed GS350 AWD. For truly inspired driving, Canadians turn to the GS460, featuring an exhilarating 342-horsepower V8 mated to an eight-speed automatic Super Electronically Controlled Transmission. Designed and engineered for power and agility, the GS460 epitomizes intelligent, effortless performance. Whether it’s a winding road or the open highway, the GSseries boasts some big performance technologies to keep it moving solidly on target. The state of the art Lexus Vehicle Dynamics Integrated Management (VDIM) system is standard fitted to all GS models, and backstopped by Vehicle Stability Control (VSC) and Traction Control (TRAC) technologies, plus Hill Start Assist Control (HAC). Those looking for maximum control in all weather can opt for the GS350 all wheel drive edition. Highly responsive electric power steering is fitted to all models, while the more powerful GS460’s electric power steering is enhanced with a variable gear ratio to improve its drivability during rapid acceleration. All GSseries models feature an independent double-wishbone suspension up front, and multi-link control arm suspension at the rear, with stabilizer bars fitted to both. The GS460’s handling and control is further enhanced with the Lexus Adaptive Variable Suspension system fitted front and rear. 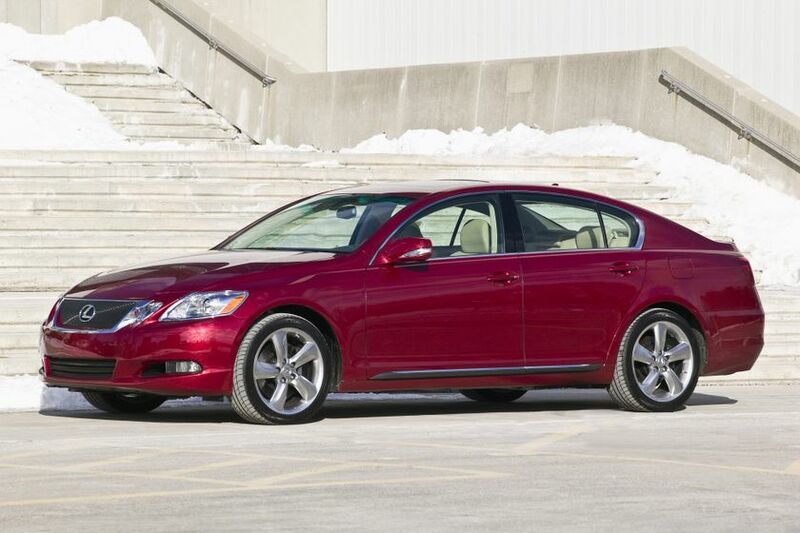 The 2009 Lexus GSseries seats five adults in comfort and style. But it also incorporates many active and passive safety systems to help protect them. In addition to VDIM, VSC, TRAC and other active handling and control design decisions, the GS features a tire-pressure monitoring system and a generous suite of braking systems. These include power assisted ventilated disc brakes at all four corners, including larger diameter front ventilated disc brakes on the more powerful GS460. All models are enhanced with the Lexus Antilock Braking System (ABS), Brake Assist (BA) and Electronic Brake Force Distribution (EBD) as standard equipment. Inside the GSseries performance luxury sedans, standard safety systems include dual-stage driver and front passenger airbags, front seat mounted side airbags, and front and rear head/side curtain airbags. The GS350 may also be fitted with two additional airbags – rear seat side mounted. Three-point lap and shoulder seatbelts are fitted in all five passenger positions, and include adjustable “B” pillar shoulder belt anchors plus front and rear seatbelt pre-tensioners and force limiters. Younger passengers are protected with anchor points for child restraint seats and child protector rear door locks. And because safety is important even when a GSseries performance luxury sedan is parked, all models are also equipped with an anti-theft system, engine immobilizer, first aid kit and a tool kit. Buyers may personalize their 2009 Lexus GSseries performance luxury sedan on the Lexus of Canada web site (www.lexus.ca) or by visiting any Lexus Dealer across Canada. Buyers of any 2009 Lexus GSseries performance luxury sedan enjoy the peace of mind that comes with the industry-leading Lexus comprehensive warranty that covers the entire vehicle for four years/80,000 kilometres. Power train components are covered for six years/110,000 kilometres, major emission control components are covered for eight years/130,000 kilometres and corrosion perforation for six years with unlimited distance. Service adjustments - minor repairs not usually associated with the replacement of parts - are fully covered for one year/32,000 kilometres, while Lexus owners also enjoy the Tire Road Hazard Protection warranty and access to alternate transportation. The purchase of a new GS350 or GS460 also includes free membership in Club Lexus, an online convenience service that places important vehicle ownership information at the guest’s fingertips. Includes: Rear seat side airbags; Heated driver and front passenger seats with ventilation fans; Wallet-sized smart card key; Clearance and backup sensor; Power rear window sunshade; Rain-sensing wipers; Adaptive Front Lighting system; Headlamp washers; DVD-based navigation system with back-up camera; Rear spoiler. Includes: Rear seat side air bags; Heated driver and front passenger seats with ventilation fans; Wallet-sized smart card key; Clearance and backup sensor; Power rear window sunshade; DVD-based navigation system with back-up camera; Rear spoiler. Includes: Rear seat side air bags; Heated driver and front passenger seats with ventilation fans; Wallet-sized smart card key; Clearance and backup sensor; Power rear window sunshade; DVD-based navigation system with back-up camera; Rear spoiler; Mark Levinson Audio system featuring AM/FM stereo/cassette, Compact Disc DVD auto-changer and 14 speakers; Wood and leather-wrapped steering wheel and shift knob. Includes: DVD-based navigation system with back-up camera; Rear spoiler. Features: Aluminum alloy block; Dual overhead cams; 24 valves; Dual Variable Valve Timing with intelligence (Dual VVT-i); Direct Ignition System; Electronic Throttle Control System with intelligence (ETCS-i); Acoustic Control Induction System (ACIS); Stainless steel exhaust. Features: Aluminum alloy block; Dual overhead cams; 32 valves; Variable Valve Timing with intelligence electrically-driven on intake cam (VVT-iE); Variable Valve Timing with intelligence on exhaust cam (VVT-i); Direct Injection System; Electronic Throttle Control System with intelligence (ETCS-i); Acoustic Control Induction System (ACIS); Stainless steel exhaust. Unique to Lexus, VVT-iE provides the ideal air-fuel mixture for efficient combustion and optimum performance over a broad range of engine speeds. It increases torque at lower speeds and horsepower at higher speeds to improve engine performance and fuel economy, as well as help reduce emissions. The Engine Control Module receives data from a variety of sensors and signals the actuator to adjust the camshaft the amount needed to create perfect timing for engine speed and load at that exact moment. The exhaust cam is controlled by Variable Valve Timing with intelligence (VVT-i), a Lexus engine system that continually varies the exhaust valve timing to deliver optimal valve timing for a full range of driving conditions. It improves drivability, performance and fuel efficiency, and reduces emissions. Features: Overdrive; Sequential multi-mode shifter; Snow mode; Lock-up torque converter; Transmission cooler. Fuel efficiency (GS350): 10.9 L/100km city; 7.4 L/100km highway. Fuel efficiency (GS350 AWD): 11.6 L/100km city; 8.0 L/100km highway. Fuel efficiency: 12.4 L/100km city; 8.1 L/100km highway.